Did you know that you can temporarily disable all timeline effects at once? This may be helpful when you want to do some timeline work, yet some performance heavy effects slow down this work. Alternatively, you may want to consider using Kdenlive’s timeline preview. You’ll find the corresponding option in the main menu Timeline > Disable Timeline Effects. This disables or re-enables all timeline effects, that is, timeline clip effects and track effects. However, please note that prior to Kdenlive 16.08.1, track effects are not properly disabled or re-enabled by Timeline > Disable Timeline Effects. 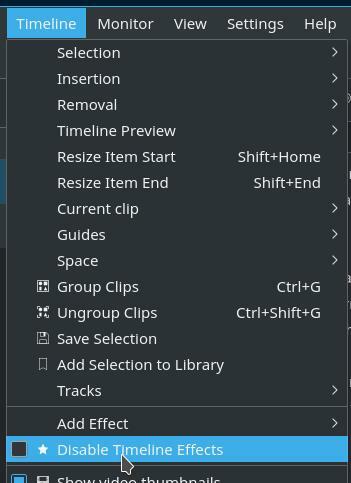 Please see effects everywhere about how to temporarily disable bin clip effects.